The goal of this newsletter is to provide community information, crime prevention tips & education, inform you about crime in our community, and alert you to upcoming Police Department events. We look forward to sharing this information and helping you learn how to keep your families, homes and property safer. 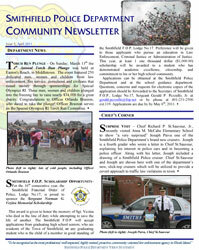 Although the newsletter will be available at the Smithfield Police Station and on our website, our primary goal is to provide it via email. If you would like to join our mailing list, simply send an email, with “Newsletter” in the SUBJECT line, to newsletter@smithfieldpd.com. That’s it! The email account you send it from will be the email address to which the newsletter will be sent. Within 72 hours you will get a reply stating that you have been added to our mailing list.